Real Estate Financial Modeling Course. 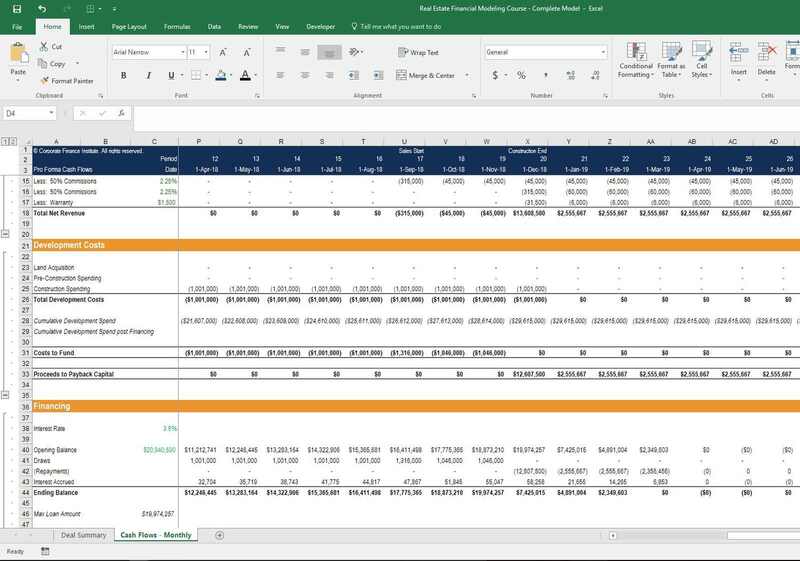 Our real estate financial modeling (REFM) course is designed to teach you how to build a development model in Excel from the ground up. Real estate developers have to build dynamic cash flow models to analyze investment opportunities. They are specifically designed to accommodate changes in key assumptions, such as land acquisition cost, interest rates, building materials, labor, absorption rates, sales prices, market expenses, permitting, and much more. CFI’s REFM course covers a wide range of real estate development topics. The course will lead you step-by-step through the development process, from land acquisition to construction and absorption. Want to learn more? Take a free trial of our REFM course now! What else is covered in the REFM course? Our Real Estate Financial Modeling Course also includes very detailed and advanced cash flow waterfall modeling between General Partners (GPs) and Limited Partners (LPs). This approach to modeling cash flows allows some partners in the project to earn disproportionate returns relative to other partners. They can achieve these return by clearing Internal Rate of Return (IRR) hurdle rates that increase their percentage of cash flow distribution. To learn more about cash flow waterfalls launch our REFM course now! To find out more about finance careers out our interactive Career Map.